Children of all ages love rocks and minerals. Mini Me Geology kits by Giverny, Inc are the perfect, educational products for anyone interested in science. Our Professional Geologist designs each kit series with different age groups, settings, and interests in mind. This guide will help you choose the best kit for your children and students based on their level and type of interest. The first step is to decide on a kit series. The following summaries will help you determine which kit series is most appropriate for your child or students. 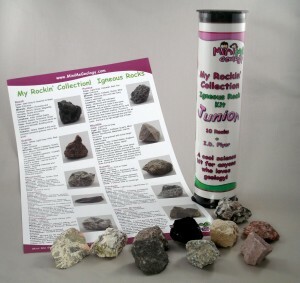 The My Rockin’ Collection series is our deluxe line of rock and mineral kits. This series is perfect for anyone who loves geology. These deluxe kits feature 10 or 15 (depending on the kit) large mineral and rock samples, a hand magnifier, and identification cards or brochure. The mineral kit also includes white and black streak plates for testing. The contents are housed in a sturdy storage box with foam padding and identification stickers below the foam so you can see if you properly identify the samples. The box closes with a snug fit so that every sample stays in its own section. These kits are good for classroom and home school lessons too. See these kits in action in this video about the My Rockin’ Collection series. The My Rockin’ Collection series is recommended for ages 6 to adult. Children should be able to read for maximum benefit or have the assistance of an adult. See all of the My Rockin Collection Deluxe Kits. The Colossal Rock and Mineral Kit is a two box set with a total of 40 samples – 10 samples each of minerals, igneous rocks, sedimentary rocks and metamorphic rocks. The kit also includes a hand magnifier, white streak plate, black streak plate and four rock and mineral identification posters. The samples included in this kit are the same as the samples in the My Rockin Collection Junior kits. 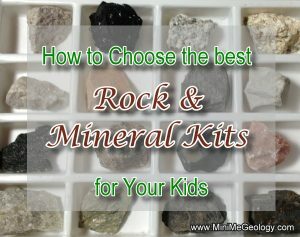 Find out why kids love The Colossal Rock and Mineral Kit in this video review. This kit is recommended for ages 6 to adult and is perfect for kids and collectors who want to have a large sample set or classrooms and home school groups. 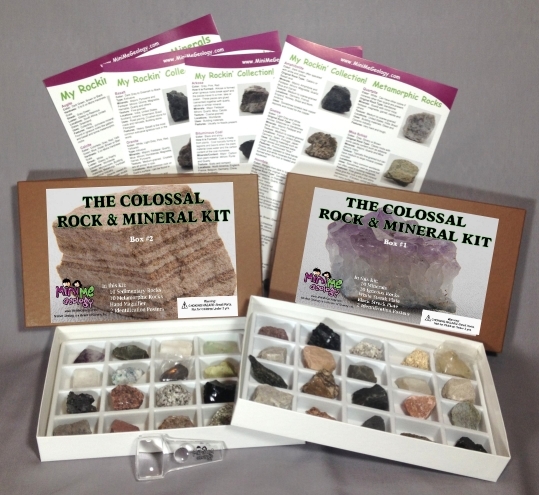 Learn more about The Colossal Rock & Mineral Kit. The Rock Cycle Kit includes a total of 20 samples – 5 samples each of minerals, igneous rocks, sedimentary rocks and metamorphic rocks. This kit also includes a hand magnifier and a CD with a 36 page, full-color eBook that explains how to identify rocks and minerals and how the processes of the rock cycle work in our world. 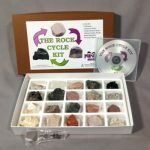 Learn more about why kids love The Rock Cycle kit in this video review. This kit is recommended for ages 6 to adult and it easy to incorporate into summer fun activities or a home school or classroom setting. Learn more about The Rock Cycle Kit. The My Rockin’ Collection Junior kits are a perfect introductory kit for beginning geologists, home school families, and school classrooms. Each kit comes with 10 samples and an identification poster with details about each sample and a photo. Learn more about these fun kits in this video review. The My Rockin’ Collection Junior series is recommended for ages 6 to adult. Children should be able to read for maximum benefit. See the full line of My Rockin Collection Junior Kits. 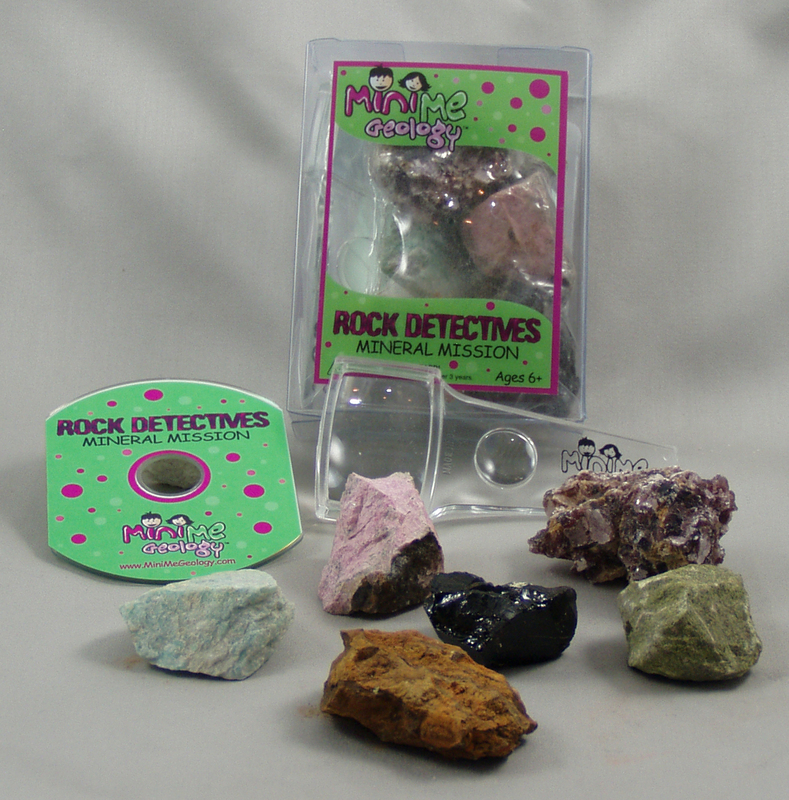 The Rock Detectives are the perfect mineral and rock kits for kids who are just starting out in geology. 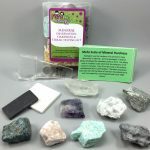 Each kit contains 6 or 7 rocks or minerals, a hand magnifier, and a printable mini-CD with a 30-page eBook full of of geological information, rock and mineral identification activities, puzzles, experiments, projects, coloring pages, creative writing exercises and fun! The Rock Detectives kits help children become involved in scientific exploration and learning. These kits are also popular for home school lessons for elementary age children. See these kits in action in this video about the Rock Detectives series. The Rock Detectives series is recommended for ages 6 to 12. Children should be able to read for maximum benefit. Adult supervision is required for some of the experiments. See the full line of Rock Detectives Kits. The Mineral Observation, Hardness & Streak Testing Kit will give you hours of fun while you explore the MOHS hardness scale, testing minerals for streak and learning to observe differences between mineral samples. This kit is designed for our young rockhounds who enjoy identifying mineral samples, classrooms and home school science labs. This kit includes eight mineral samples from the MOHS hardness scale, a hand magnifier to see the details of every sample, a white and black streak plate and a information about how to use each item in the kit and details about each samples. Learn more about the Mineral Observation, Hardness & Streak Testing Kit.